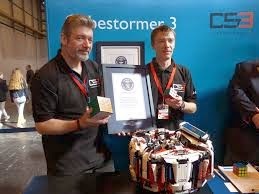 CubeStormer 3, fastest robot to solve Rubik's cube in just 3.253 seconds - New Guinness World Record! The Robot CubeStormer 3, is presented with the Guinness World Record for analyzing and solving a Rubik's cube in just 3.253 seconds. It's predecessor CubeStormer 2 took 5 seconds to solve the same task. As you know humans take minutes solve the cube puzzle, this victory of CubeStormer 3 can be considered a big step of Robot dominance in near future. Creators of CS 3 : ARM engineer David Gilday and Securi-Plex security systems engineer Mike Dobson. CS3 was awarded a new world record for Fastest robot to solve a Rubik's Cube on Saturday the March 15th 2014. The Samsung Galaxy S4 smartphone powered robot managed to solve the Rubik's Cube in an amazing time of just 3.253 seconds. Robot was constructed from LEGO building-blocks, it uses a Samsung Galaxy S4 smartphone powered by an Exynos 5 Octa application processor with a special eight-core ARM chip as its brain. it uses four robotic hands to do the arrangement.